except fig. 1b, which has its own scale bar. Figs. la,b, 4, 5, 7. Perichlamydium arachium. 28B(a), BSS 015B(F) EF N26, BSS 144(Q) EF T24 and BSS 34B(F) EF W33. 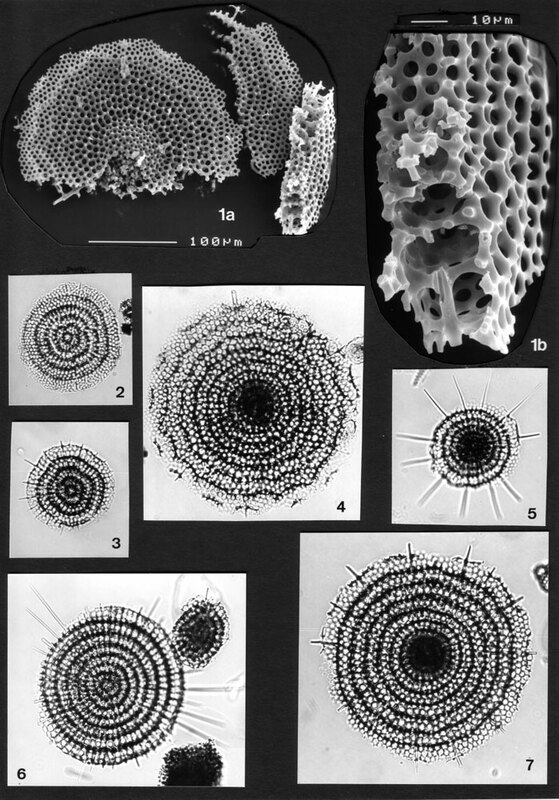 The central structure, which consists of concentric discoidal shells (SEM-photo in fig. 1a), is visible as a dark zone under the LM (figs. 4, 5 and 7). Outer rings are more or less rectangular in cross-section (fig. 1b) and may have a wavy/polygonal outline (figs. 1 and 4) or a more circular one (figs. 5 and 7). Figs. 2, 3, 6. Perichlamydium concentricum. Central disc is surrounded by four lobed chambers, the shape of which is mimicked by subsequent rings (esp. in figs. 2 and 3). Note also the interruption in third and fourth rings of fig. 2 (at two o'clock). BSS 153B(F) EF L31, BSS 49B(F) EF V34, and BSS 153B(F) EF K28.